A 2015 federal lawsuit over nitrate contamination in the Raccoon River pits farmers against water users and pushes Iowa to action on water quality. Depending on your perspective, the Des Moines Water Works lawsuit against three agriculture-heavy Iowa counties to hold them accountable for harmful nitrate contamination in the Raccoon River water supply can be a few things: a battle between farmers upstream and urban water users downstream, a common sense plan to get polluters to pay, or a costly intrusion into private land use. One point of agreement across Iowa is that this unprecedented litigation has stirred up controversy. We have spent several decades trying to work collaboratively with agriculture groups. Realistically that has gotten us nowhere. The curve continues to deteriorate in terms of water quality that we are experiencing here in central Iowa. We think that we are in a water quality crisis… It’s clear that we are facing a far worse condition in 2016 than we did 25 years ago. The federal lawsuit came in 2015 after the Water Works was forced to operate their nitrate removal system for long stretches when record-high levels of the toxic nitrogen compound were present in the Raccoon River, the water supply for 500,000 people in the Mississippi River basin. Sac County, named in the suit, had testing done on its waterways that empty into the Raccoon and some were found to be five times higher than the standards EPA deems safe, according to the utility. Besides simply recovering the $1.5 million it cost to run the denitrification system in 2015, the utility had higher aims of halting pollution at its source. In this case the utility established that the primary pollution source is runoff from farm fields and animal operations that flow from tile drainage (subsurface drains) and end up in streams, lakes, rivers and, eventually, the mighty Mississippi. It’s a really delicate subject because inevitably, with an issue like water quality, a source has to be identified; the cause of the problem. But at the same time, to have the best chance of reaching a solution you have to minimize the finger pointing and do as much on a unified front where multiple interests can align, and I think that might be where we are struggling a bit in Iowa right now. The problem, to date, is that the current system of voluntary conservation efforts by farmers and producers has failed to improve water quality, which is actually in decline. A recent state assessment found a 15 percent increase in the number of waters impaired by problems like bacterial outbreaks and nutrient pollution from just two years prior. This decline occurred even as the Iowa Nutrient Reduction Strategy was created to limit excess nitrogen and phosphorus in state waters which flow into the Mississippi River and contribute to the massive Gulf of Mexico dead zone every year. Frustration and lack of an aggressive water quality plan led Water Works to the courts to pursue a novel legal strategy that asserts that county drainage districts are point-source polluters that are directly identifiable because their infrastructure carries nutrient-rich farm runoff. The districts manage and maintain this infrastructure, so it’s the Water Works claim that the districts, supervised by the counties, are on the hook for the water. This is a unique twist since agricultural runoff is normally considered nonpoint source pollution with hard-to-discern origins, which has meant many agricultural practices are largely exempt from Clean Water Act regulation. If successful, the lawsuit could hold farmers accountable for the polluted water that runs off of their fields and manure lagoons, drains into discharge canals and ends up in downstream waterways for others to deal with. Such a ruling could not only affect the legal responsibility of farmers in Iowa, but have implications throughout the United States. I think we have farmers who are doing it the right way and want to do it the right way but want to maintain the competitive advantage, and anything that can be perceived to hurt that competitive advantage is something that they’ll be more wary about adopting. So the incentives have to give them the peace of mind that they will be able to protect the environment without adversely impacting their productivity. Maintaining a viable business with razor thin margins in the unpredictable world of farming is difficult. Yet everyone depends on clean water as a shared resource. Farmers know this and have formed groups like the Iowa Agriculture Water Alliance, which has joined with the City of Cedar Rapids in the broad-based Middle Cedar Partnership Project that at once reduces nutrients and controls floods at a watershed level. Farmers are like environmentalists, clean water advocates, and public officials who all want clean water, but are well aware that the status quo is ineffective. 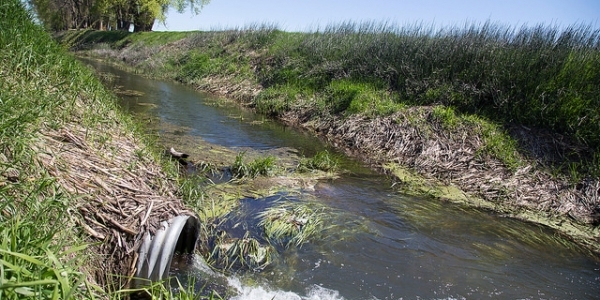 To ask farmers and producers to do their part by investing in nutrient management practices is a necessary and hugely consequential step towards cleaning up Iowa’s waters. At the same time, the state must help farmers invest in clean water improvements to ensure success. The precise mechanism for success might be a mix of regulation, financial incentives and collaboration in varying parts, but it’s the commitment by all stakeholders to see it through that matters. Regardless what occurs in the Iowa state legislature in 2017, the Des Moines Water Works lawsuit has pushed the state into action on water quality. This post originally appeared in Ecocentric. Photo by Clay Masters.